Many people have traumatic childhood memories of being forced to this vegetable. But Brussel sprouts can be so much tastier than those over cooked grey-green sulphuric lumps of my childhood. If you’re avoiding Brussel sprouts you should give them another go. Blanched in the microwave they should stay bright green and crunchy. 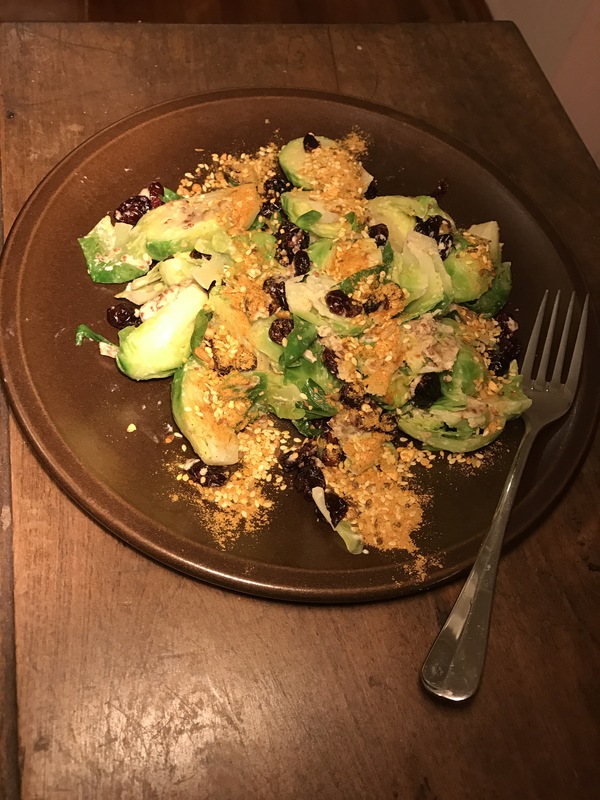 Brussel sprouts are nutritionally dense and super filling, so even with only 5 ingredients this salad still feels like a meal. Dukkah is a pantry essential for me. It’s a Middle Eastern spice mix with nuts. Typically it’s eaten by dipping bread into olive oil and then the Dukkah, but it’s also used as a seasoning. Sorry I wasn’t able to convert you to Brussel sprouts, I’m glad your friend liked them. Thanks for sharing.